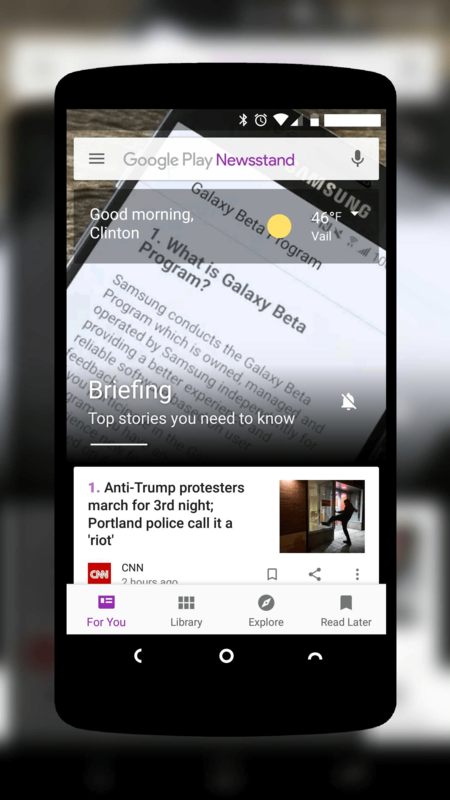 The news aggregation and magazine reading app from Google, Google Play Newsstand, has a major update rolling out today into the Play Store. The new version 4.0 of the app is, more-or-less, a complete revamp of the app. The new update is more in line with Material Design and overall Android app design and features bottom navigation instead of being driven from the hamburger menu like the previous version. The new For You section gives you a summary and highlights of news from various sources including sources for local news. New in the app is the ability to have this section of the app downloaded to your device for offline reading. You also note that the articles are heavily AMP driven for faster loading and when you have read an article, the title will go from bold to normal text to let you know. any magazines you had purchased or subscribed to were located on a tab in this section of the app. No more. Scroll down to the bottom of this Library page and there you will find your magazine subscriptions. This collapsing of things does make it easier but can be confusing the first time you fire things up. At the top with the Topics & Sources, there is also a Digest tab. This gives you a summary of articles from your topics and sources which you can read, mark to read later and share. The Explore section of the app works identical to the old version, giving you broad topics to explore and add to your Topics & Sources. Finally, there is the new Read Later tab which has moved from the menu to the navigation bar on the bottom. If you use Google Play Newsstand a lot, which I do, this is a refreshing update. The old app, frankly, was a bit touchy to navigate but this new look and navigation is far easier. If you have the app installed on your phone, the update should be coming to you via an OTA update over the course of the next few days. If you haven’t installed it, you can download it for free in the Google Play Store.